More than 40% of elite sportswomen in Great Britain have experienced sexism but only 7% have reported it, according to a survey conducted by BBC Sport. The anonymous questionnaire was sent to 568 women in almost 40 different sports, with 339 responding. Asked why sexism was not reported, one respondent said she believed it could affect her selection chances. Another was worried sexism could be perceived as "banter", while a third said "inequality is normal". Sports Minister Tracey Crouch coaches a girls' football team and believes more needs to be done to "stamp out" sexism, while cautioning that it is difficult to eradicate such behaviour without it being reported. "I would really encourage people to come forward and report it if they are seeing incidences of sexism," Crouch said. "It shouldn't be tolerated and we need to make sure we're doing all we can to stamp it out." Crouch was also disappointed that many top sportswomen fail to earn a living from their sport and hopes steps will be taken to address that. "Much progress has been made to make sure we do have the commercial sponsors to provide that additional funding for our athletes, but clearly much more needs to be done," she added. What does UK Sport think about all of this? Liz Nicholl, who is the chief executive of UK Sport, believes the funding body's high-performance system does make a difference for women in sport. Women make up 45% of athletes on UK Sport's World Class Programme, with a combined 105 medals won by British females in the last summer and winter Olympics and Paralympics. However, Nicholl added: "If any female athlete in our high-performance system feels marginalised in this way, we want to hear from them, as this is unacceptable. "More needs to be done to drive the inclusion of women in sport at all levels, from the playing field to the board room, and we are committed to supporting our funded sports to continue to make progress in this area." 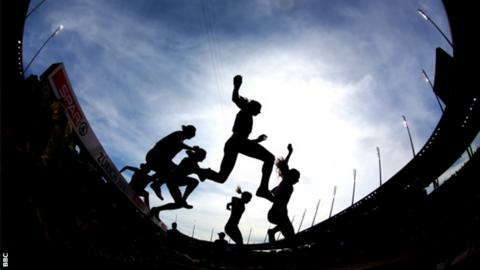 A similar study was conducted by BBC Sport in 2013 and the results are alike, and Paula Dunn, who is the first female head coach at British Athletics, said more needs to be done to make a career in sport attractive to women. Fewer than 15% of UK coaches in high-performance sports are women. She said: "At British Athletics we do have quite a number of high-profile females so as a sport we're trying to address the imbalance, but we know it's not something you do overnight. "It's a slow, long process and we need to make sure females that are put into those jobs are the right people for the jobs. "It's all about perception. If people feel there is a career pathway you can dream to aim to get to that role. "But if you see nobody that looks like you, you don't see a female, you don't see a person of colour then it makes it very difficult to say actually I want to be that person. So I think role models are critically important." The electronic survey was sent to representatives of archery, athletics, badminton, basketball, bobsleigh & skeleton, boccia, boxing, canoeing, cricket, curling, cycling, equestrian, fencing, football, goalball, golf, gymnastics, handball, hockey, judo, netball, rowing, rugby union, sailing, shooting, skating, short-track & figure, skiing and snowboarding, squash, swimming including diving, table tennis, taekwondo, tennis, triathlon, volleyball, weightlifting, wrestling. Modern Pentathlon and Badminton Wales could not get the survey out to their members to complete it by the deadline. 1. Are you a full-time athlete? 2. Are you able to make a living as a sportswoman? 3. Compared to men, do you feel sportswomen are underpaid and the financial rewards inadequate? 4. Do you think prize money should be equal among men and women in all sports? 5. Do you consider you get enough coaching support compared to men? 6. Do you believe your governing body supports you equally, compared to male colleagues? 7. Do you think the media should do more to promote women's sport? 8. If you have children, do you think the level of childcare support is adequate? 9. Is being gay an issue in women's sport? 10. Do you consider yourself to be a role model for other women? 11. If yes, are you conscious of your body image? 12. Have you been criticised on social media for your appearance? 13. Have you experienced sexism in your sport? 14. If you have experienced sexism in sport did you report it? If not, could you please tell us why? 15. Have you been trolled on social media?